Get All the Charm of the Traditional Blocks with Less Work! Dresden Plates, whether large or small, are so charming and can be used in many types of projects. 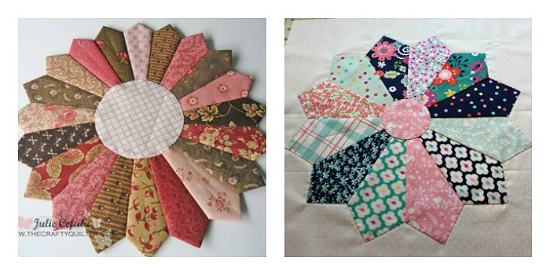 A single large one can become a table topper, trivet or a place mat. Small ones can be ornaments, pot holders and embellishments for totes and other projects. 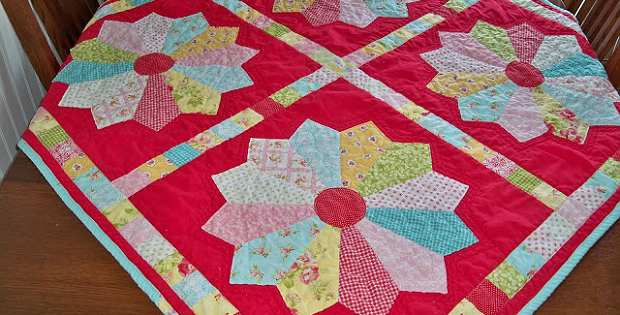 Of course, any size can be used in a quilt and we’ve seen many lovely examples. While the blocks aren’t necessarily difficult to make, they do require precision to create a circle that lays flat. Typical Dresden Plates have 20 blades. However, you can have all the charm with less work by using fewer blades for a more chunky look. Traditional 20 blade block on the left, 12 blade block on the right. Julie Cefalu from The Crafty Quilter has written a comprehensive tutorial for making a chunky Dresden Plate block with just 12 blades. We love the look of the block and can imagine several ways to use it. Use the template Julie provides to cut the blades for a Dresden Plate that is 13 3/4″ wide from point to point. Or, go with a 30 degree ruler (get one here), which makes it easier to adjust the length of the blades and the size of the finished block. Click here for the free “Chunky Dresden Plate” tutorial. Amy from A Quilting Sheep has written an equally good tutorial. 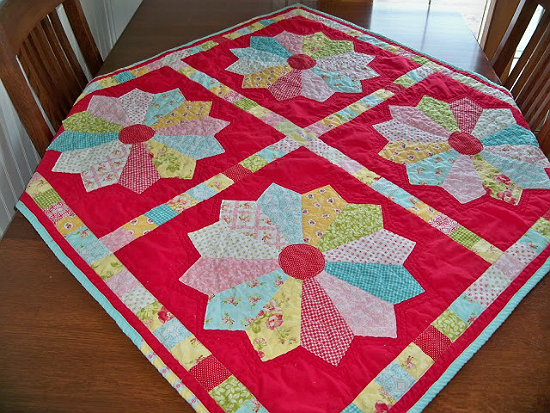 Her blocks are 3 or 4 inches larger, as she started with 8″ strips instead of the 6″ strips in Julie’s tutorial. Be sure to look at both tutorials, as they handle the center circle differently. Choose the method that works best for you. Or, if you want to get fancy, use a small Dresden Plate for the center, as in Amy’s beautiful example shown above. This would be a stunning table topper. 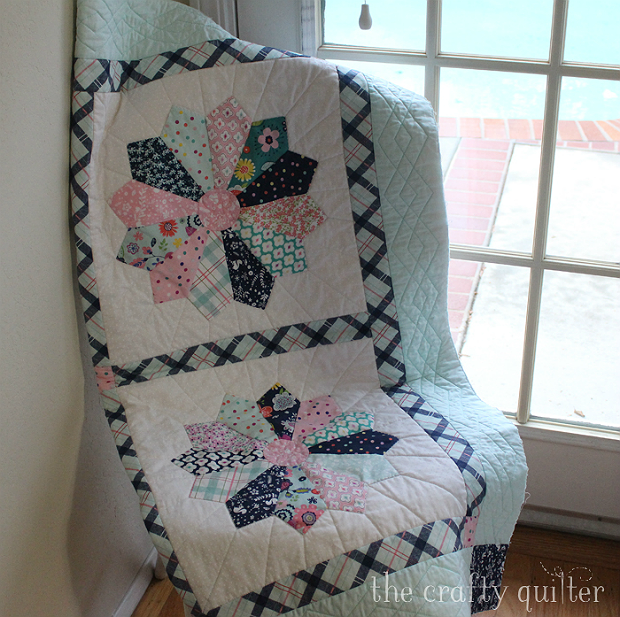 Set the block on a square piece of fabric and finish it off as you would a mini quilt. 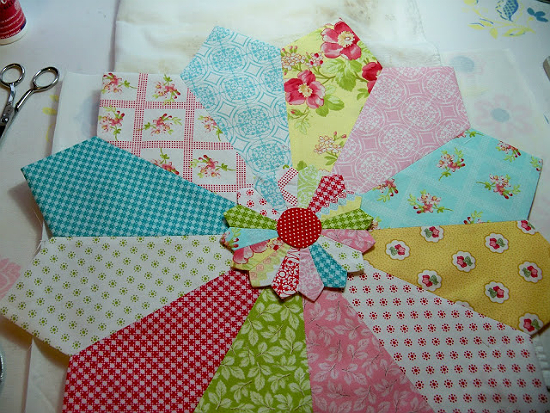 Or, place the block face down on the backing (face up, laying on batting), sew around the outside edges and turn. Click here for the free “Dresden Plate Mini Tute” by Amy.